The following words are by principal acoustic design engineer Erich Tisch. When people think of amazing audio, whether recording or listening, they typically think of controlled environments—like studio isolation booths that ensure what the musician is playing gets tracked without interference or headphones that pump sound directly to the listeners ears. The challenge with GoPro audio is to capture sound in uncontrolledenvironments. GoPro cameras (rightfully so) get thrashed in and out of water and pummeled on the handlebars of mountain bikes, but throughout it all, are expected to capture the subtleties of a quiet conversation. In every case, the audio is crucial to creating an immersive experience and bringing you back to that moment. There are a few distinctions between standard microphones and those on a GoPro. 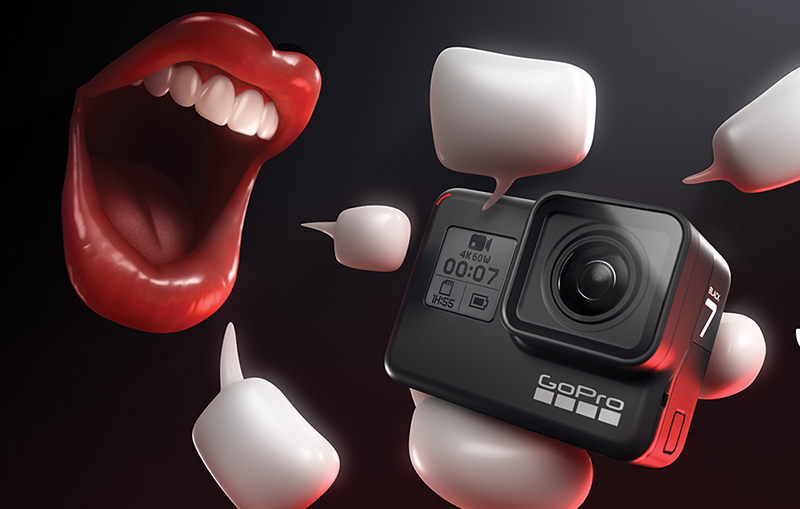 First of all, standard microphones are not designed to handle this range of environments, so the goal for GoPro is to capture sound without allowing tiny pressure fluctuations to affect the microphone diaphragm and create an electrical signal that is misinterpreted as sound. For example, a gust of wind buffeting near a microphone port or that coupled with the vibration of a road bike frame, may be interpreted as sound, even though these cases don’t actually make any noise. Last (but not least), microphones are not inherently waterproof. For these reasons, GoPro microphones need some protection. The trick is to provide microphone protection without impacting the microphone’s ability to perform. You can pretty easily shield a microphone from water by putting it inside a plastic box, but then you block sound from getting to it. HERO7 implements a dedicated secondary waterproof membrane that functions in lock step with each microphone on the camera. This secondary membrane is lighter and stronger than those on predecessors and protects the microphones with certainty, whilst allowing even the subtlest of sound to be picked up by the microphone. This coupling of a waterproof membrane to the microphone is also optimized to reduce sensitivity to vibration. With HERO7 Black, integrating microphone protection was done with precision and care. By tightly controlling the design and process, the audio system behaves predictably and consistently. This is not only an important part in providing reliable performance but it’s critical when using the microphone signals in advanced audio processing to remove wind, create stereo, avoid water or respond to voice commands—all of which factor into the improved audio on HERO7. With the video above, you can see how audio, even while mountain biking, is crisper despite wind and other elements. Another prime example is water, which is one of the most common environments GoPro is used in. Water can easily get trapped in a traditional microphone port creating a muffled sound until the water has had a chance to escape. To solve this, one of the microphones on HERO7 has a special geometry that allows water to escape, almost immediately. When the camera detects that the microphone ports are clogged with water, this microphone is automatically selected ensuring nothing is missed, even right as the camera comes out of the water. Ultimately, the audio you capture with HERO7 will be natural and immersive while maintaining the robustness you know and love from a GoPro. In Protune, turn on RAW Audio to capture an uncompressed version of audio in a separate 4-channel WAV file. Setting RAW Audio to Low gives you all 3 unprocessed mic signals to play with in post-production. Keep in mind the signal level may be super low since these mics have a wide dynamic range. Setting RAW Audio to Medium will give you 2 channels of processed signal without dynamic range compression. Setting RAW Audio to High gives you 2 channels of processed with dynamic range compression. In Protune, toggle the Microphone Setting of Auto, Wind or Stereo to match the activity you are doing. Auto will dynamically switch between Wind and Stereo audio processing to optimize for all situations. HERO7 Black defaults to Auto. Wind Mode leverages all three of the HERO7 mics to give you the cleanest signal in windy situations. This setting affects audio outcome in MP4 and RAW WAV files set to Medium or High. It does not impact the RAW Audio Low mode. Consider where you mount the GoPro with respect to wind when framing your shot. Mount without objects upstream—as an object moves through the wind, it creates turbulence in its wake that can wreak havoc on a microphone mounted behind it. Keep in mind that the best place to capture audio may not be the same as the one that gives you the best image. You can utilize the HERO7 Black’s external mic support to position a microphone separate from the camera to optimize image and audio individually. See more tips & tricks and “Master the Modes” features here.